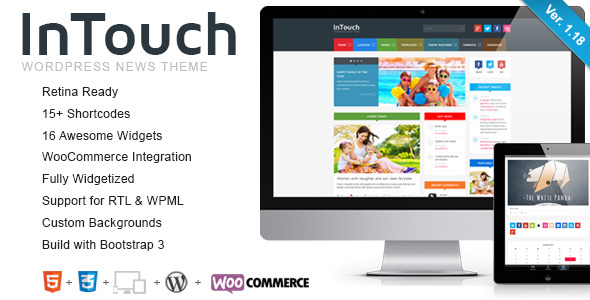 InTouch is a super-duper customizable, very unique, responsive, retina-ready WordPress Theme that everybody wants. of options to manage and modify any aspect of the theme – it is well suited for both beginners with no coding knowledge and developers. It comes with 16 custom widgets, 20 widgetized areas , 5 post formats (image, audio, video, gallery, standard), 4 Home page layouts and tons of theme options. InTouch theme developed on the Bootstrap — beautifull boilerplate for responsive development so it look beautiful at any size, be it a 17” laptop screen or an iPad, iPhone. InTouch is 100% WooCommerce compatible, and also includes full design integration that looks amazing! Check out our online shop demo to see how beautiful and functional your shop can be with the Lynx theme, it’s incredibly smooth!